Except for a location along its namesake bay, there’s nothing remotely edgy about Carmel-by-the-Sea. More bougie than boho, the village still venerates its era as an artists’ colony a century ago, even during the current epoch of $2 million homes and a main drag that hosts a year-round Christmas store and a boutique dedicated to Alice in Wonderland. But Carmel sure is beautiful. Down side streets, oaks twist and spread over storybook cottages that look like something out of an Imagineer’s fever dream. 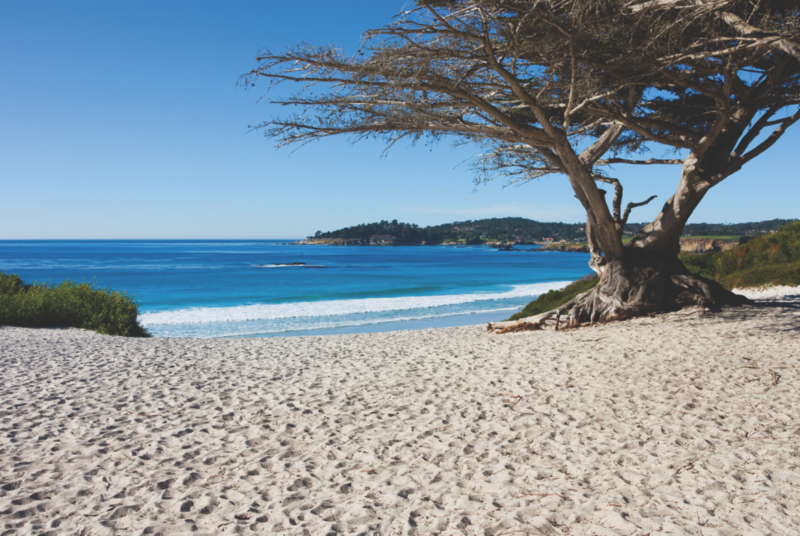 The sands of Carmel Beach are as sugary white as a Maldives atoll, and when the coast is socked in, the sunny wine country of Carmel Valley is always a short drive inland. With those frequent foggy mornings, Carmel awakens slowly, making breakfast and that first cup of coffee all the more essential. Lafayette Kitchen & Cafe serves both sweet and savory crepes, including the Carmel with leeks and smoked salmon. Tucked of Ocean Avenue in this town of hidden passages, the Carmel Coffee House and Roasting Company brews artisanal organic coffees best savored on its secluded Spanish-style patio. Keep the car parked and explore on foot as you follow Scenic Drive along the bay, where the Frank Lloyd Wright designed Clinton Walker House commands Carmel Point. Above the point, poet Robinson Jeffers hand-built his stone Tor House and the castle-like Hawk Tower in the late 1910s, both open for docent-led tours. Back downtown, the Weston Gallery displays works by former residents Edward Weston and Ansel Adams, as well as those of such fellow California icons as Imogen Cunningham, while the Photography West Gallery has rooms dedicated to Weston’s celebrated son Brett and also Adams. A quarter-mile away, a 1950s motor court has been re-envisioned as The Getaway ($161-$415), a breezy, beachy boutique inn from the Gavin Newsom-founded PlumpJack Hospitality Group. PlumpJack’s other recent motor court reno, The Hideaway ($230-$575), is, true to its name, more secluded, with a cobblestone courtyard and an address that’s a couple of blocks of Ocean. Tasting rooms fill downtown (the Wine Tasting Passport is good for sampling at ten of them), but do yourself a favor and go to the source in Carmel Valley about 20 minutes away. The valley has a cluster of tasting rooms in Carmel Valley Village, including Parsonage winery with its bold, small-batch cabernet sauvignons. Take a break from sipping to see the Moto Talbott Collection, 170 motorcycles from 16 countries—everything from a 1911 Indian board tracker to a 2006 MV Agusta F4. Slow down next to the fountain on the Corkscrew Café’s laid-back patio, where the specialties include a wood-fired pizza topped with Meyer lemon, prosciutto, and arugula. If you’re not sleeping in town, stay among the vineyards at the luxe Bernardus Lodge & Spa ($295- $1,125). A $4 million renovation updated rooms with Moroccan mosaic tile and reinvented the grounds as a landscape of undulating golden grasses, fragrant lavender, and vibrantly hued succulents. Under chef Cal Stamenov, the lodge’s Lucia Restaurant & Bar takes its commitment to the regional and seasonal seriously, with an Angus filet accompanied by impeccably prepared mushrooms foraged in the forests of Santa Cruz. Barely a mile from the lodge, along the Carmel River, Garland Ranch Regional Park’s trail network explores oak woodlands and leads to a waterfall, while challenging Snively’s Ridge Trail climbs to a panorama that extends to the ocean. Moody portraits of mezcalilleras cradling agaves at Cultura Comida y Bebida hint at the honored role that premium mezcals play at this Oaxacan-inspired spot serving such innovative Mexican dishes as a rellenostyle Monterey red abalone and blue corn tamales with smoked mushroom and guajillo crema. Amid the area’s shingled roofs and stone chimneys, Gregory Ahn of Carmel Valley’s Folktale Winery & Vineyards transformed a 1970s-vintage bank building into the airy, contemporary steakhouse Seventh & Dolores. In a town like this, a little classic romance has its place, too, especially at Il Tegamino, where a courtyard table and a plate of paccheri al ragù Napoletano (made of short rib and pork rib meat) transports you to Campania. After dinner, catch a show at the intimate Sunset Center; time it right, and you might see the likes of Burt Bacharach or Emmylou Harris. Or head to Carmel Valley and the water-focused spa Refuge for rejuvenating eucalyptus steams and pools that let you soak beneath the stars. Take a spin up 17-Mile Drive through the golfscape of Pebble Beach to Asilomar State Beach, where you can follow a boardwalk into the restored dunes as well as a trail along the craggy coast. You’ll also find 11 buildings by Hearst Castle architect Julia Morgan. Take a self-guided stroll or go on a ranger-led outing. Afterward grab a bite at Phoebe’s Café in the Morgan-designed Hearst Social Hall.